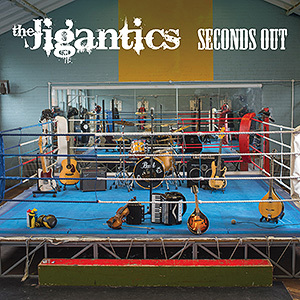 The Jigantics must be one of the most talented bands of musicians around and in just about any genre you care to name. Their command of their instruments and the ability to switch genres between blues, country, folk, pop rock, a blend of several of the aforementioned and probably several others that I've missed, is peerless. All are excellent vocalists and able to blend some of the best harmonies around, whilst in Marion Fleetwood they have one of the best and most expressive female vocalists I've heard for a very long time. Their ability to put their own stamp on the writings of others has to be heard to be believed, so why is it I have some reservations about them? I suppose it is that as far as I'm concerned a modern day 'roots band' trying to make their way have more of a chance of success if the covers, however excellent (and they are) are kept to a minimum and they use more of their own writings. Of course, if they are living in the real world (I suspect the Jigantics are) and are realistic enough to know superstardom is not beckoning (I'm not necessarily referring to the Jigantics here either) and if their recordings are being used to raise their profile and give an indication of their playing and singing talents then an album such as this more than serves its purpose, in fact I don't think I have heard a better example than 'Seconds Out' in this decade! That is not to say 'superstardom' will not arrive; I don't have a crystal ball and have been wrong too often to try to predict careers. I just think that with their set up original songs are what is more likely to propel any band working within the incredibly broad areas of roots music that they cover. Of course it could also be that they are just too good at too many genres and don't have a recognizable 'style' other than their performing quality, although on the plus side that makes them a nightmare for old hacks and promotions people alike to pigeon hole! The songs are all well chosen and in many cases are not songs that will be known by everyone, always a positive in covering other peoples writings and this band certainly don't try to copy the originals, choosing instead to put their own stamp on each song, enabling the album to be taken as a whole rather than just an album of mostly 'covers.' It is difficult to judge the quality of their four original songs alongside songs of such excellence and although I don't think they are of the same quality, many performers have built hugely successful careers on much less. They are a five piece from England that is made up of mainly multi instrumental musicians of quite astounding quality and with a huge amount of experience both singly and collectively, having played with a variety of greats in several different genres in the past and no doubt into the future. The line up is Marion Fleetwood on vocals, violin, cello, fiddle and viola, Rick Edwards, vocals, acoustic and electric guitars and slide guitar, Lyndon Webb, vocals, acoustic and electric guitars, bass guitar, mandolin, keyboards and violin, Mark Cole on vocals, accordion, harmonica, mandola and slide guitar and last but not least, Martin Fitzgibbon on vocals, drums and percussion. Additionally, Aaron Taylor played acoustic and electric guitars and banjo with Christine Collister adding backing vocals to the classic I will not wear the willow. The performances on every one of the twelve tracks are excellent with some tremendous versions of songs such as Rebel yell, Blue side of the mountain, The crow on the cradle, plus Ryan Adams Invisible Riverside as well as the Martin Fitzgibbon penned Frankly. If one of the objectives of their recordings is to get their name out there and get more and perhaps better paying gigs, this album should see them succeed 100%. If it is to sell in huge quantities and make them 'superstars' I think they really need more high quality originals and perhaps work in a slightly narrower generic field. Having said all that I'm in the process of downloading their debut album 'Daisy Roots' because although I would like to hear them developing their own song writing they are most definitely a great band on record as, apparently, they are live. Apart from the song writing and vast generic expanses it is impossible to criticise an album of this musical quality, even the reservations I've mentioned pretty much fade into insignificance when you hear the vocals and the playing. This is a very good album by a great band!